February went all too quickly and in the rush, pretty much all my habits went by the wayside. 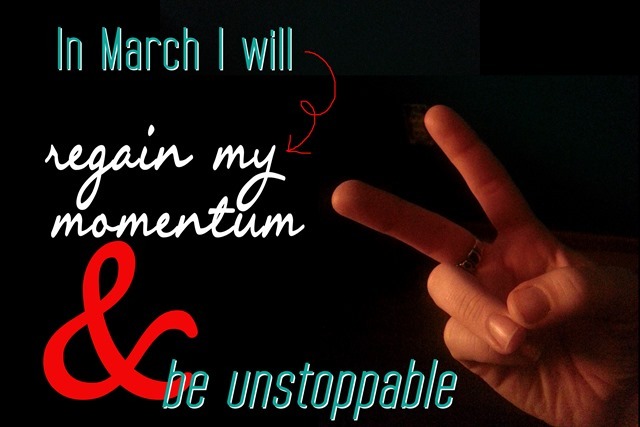 I’m still resolved to be UNSTOPPABLE though so I’m trying a different tactic this month. “Regaining my momentum” might seem pretty nondescript. It’s about not beating myself for not doing X, Y or Z and just focusing on moving the ball down the field a yard… NO MATTER WHAT. I’m identifying time suckers and doing my best to limit, if not eliminate, them. I want to keep up with all the chore type things during the week so my weekends are free to be awesome. I’m getting my hustle back. No. Matter. What!